Anyone that knows me well by now, knows I'm as much a fabric girl as anything else creatively speaking. Actually my sewing roots go back to being an 8 year old watching my mother sew my own dresses and sometimes her own too, perhaps more out of necessity than her own love for sewing but I was rapt watching the whole process, even curiously touched all the buttons on her big strong, heavy black Phaff (looked much like those treadle singer machines) even got a electrical boot one day when I stuck my finger down the empty light bulb socket on the machine- survived of course but got the worse fright, naturally I've never done it again to date LOL! Out of that start on inspiration I started to cut out my own dolls clothes (with fairly blunt scissors as I recall and got a big corn on the finger for it) and then hand sewed them together, I guess I saw it as all part of the process of being a mummy, as little girls emulate their mother's role and the era I grew up girls I might say looked forward to the day they could have hubby, home and family- in desired plan- pretty well in that order. I documented this bit of childhood memories on a scrapbook page a few years ago and here is that very page. Well needless to say the love of sewing never died as a childhood dream, I continued on in my growing years and eventually worked in a Fashion house during the day doing my apprenticeship in Dressmaking, while doing a Dressmaking and Design course at night in the Brisbane city. We made clothes for fashionable boutiques and also Bridal gowns. When I married I made my own gown and the wedding party gowns and many a bride with her attendants since. Along the way I've also developed a love for Patchwork. 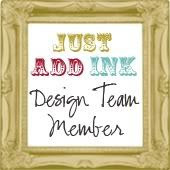 I was so rapt to discover Stampin Up's embrace into fabric as well as paper/stamping etc. Those following this blog will have seen some of my earlier projects using Stampin Up fabric and a lot of those pieces are currently doing the rounds in various Heartfelt Events. 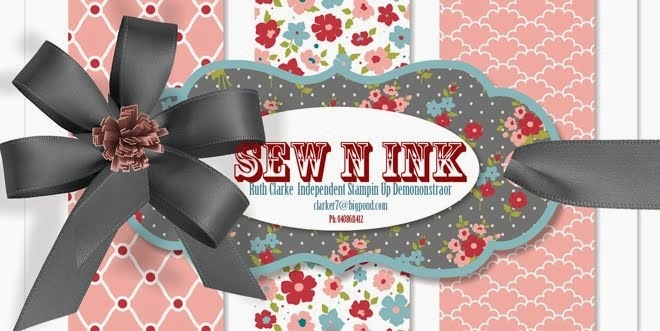 My latest play is with the Stampin Up Summer Smooches fabric. We were lucky enough to be each given a pack with the DSP of the same name while at convention this year. We are gradually redoing our kitchen at home (and I say gradually -its only been a few years so far LOL!) However once my kitchen is complete besides the Black and White theme I intent to compliment it with Red and Teal/Blue . 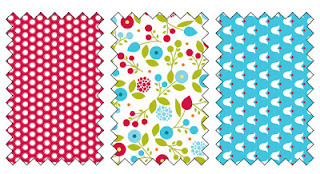 So in saying that I have made a patchwork table cloth with these fabrics and just added some plains- Red, Blue and White to extend the 1 pack and make the Smooches Fabric more the feature. I designed the quilt myself and the centre design is meant to imitate the various new Framelit Sizzixlit dies Stampin Up has launched this year. I've seen lovely Aprons as well as other projects made too in this fresh looking fabric and I'll probably do one myself in time as well while this fabric is still available this annual catalogue year. Ruthy I just love your Summer Smooches - Just Fabric.....ulous project. Your work is amazing, no outstanding, Ruthy. I just love every bit of it. When you do a project you really do it well with the framelits design in the centre. I think Shelli should look at having you on her design team very soon. Everything ties in together and it shows that you put a lot of thought in to it all. I do hope this blog goes to Utah. Thanks so much Kay, you are generous in your encouragement, I certainly did enjoy making it, love this fabric set too. Me too I think it is the only fabric that I do like in the whole range. When I saw it hanging in the display at Convention I made up my mind I would buy it and then was happy that I was given it even better. The paper is just as nice and I do like to mix the paper with fabric on the cards, see what I can do.